Recently I posted some pictures, and a video of a litter of possibly golden retriever puppies (and one terrier mix) we were fostering. I didn’t post that they were up for adoption. Just their names, and how cute they were. Apparently everyone that I’ve ever met knows that I foster, and who I foster for. Yes, Facebook is a wonderful resource for animal rescue. I believe it’s responsible for getting thousands of dogs adopted every month. So even without posting information on the puppies, I was inundated with requests to adopt them. The shelter was inundated with requests. Everyone loves puppies. And everyone wants one. They rarely spend much time at the shelters. People love to watch cute puppies. Everyone fawning over how cute they are. How much fun it must be to have them. The entertainment value, for us the humans, and our dogs. At least the ones that like or tolerate the foster puppies. Yes, they are adorable. I love to watch their fluffy little butts when they’re lined up at their bowls eating. I love to have them snuggle into my neck when they’re sleepy. That sweet puppy breath when they sneak in a kiss. What all of the puppy fans don’t understand is how much work a litter of puppies is. Or even just one puppy. They are infant dogs, toddlers when they’re ready for their forever homes. They don’t see that before puppies learn to bark, they cry and squeal. And I swear one of this litter can scream. He does it every morning from his crate in my master bathroom. At 5 am. An hour and a half before I normally wake up. They don’t see that I have to jump up from my desk every ten minutes, or every time they squeal to check on them. This litter especially, as they were orphaned, bottle fed and wanted to suckle each other constantly. They had to be kept in separate crates at night and any time I needed to leave them home alone. What they don’t see is the two dozen times a day that I mop that room. Usually with foster puppies climbing my legs while I do it. Kittens aren’t the only babies that can climb, especially yoga pants. What they don’t see is the extra 4 loads of laundry I do a day because of them. Puppies are messy, and obviously not potty trained. That washing my hands 500 times a day, because of handling the puppies. 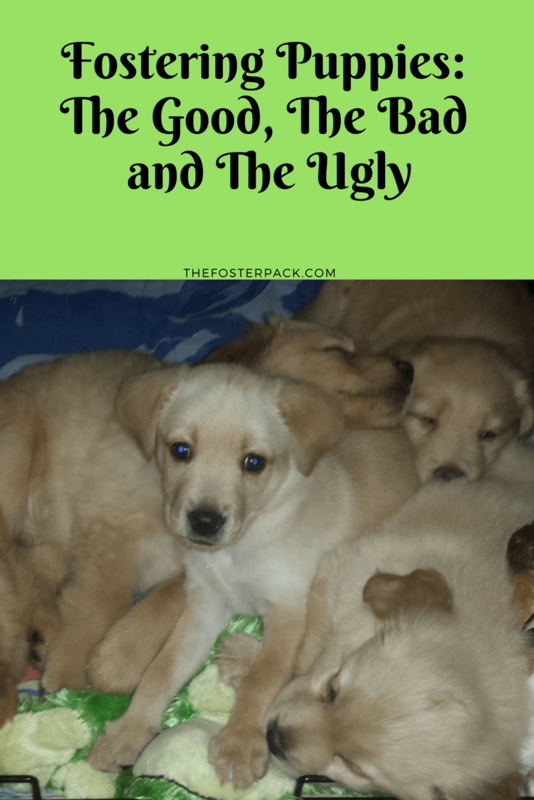 The frequent puppy bathes, because again – they are messy little buggers. All five of these puppies will be adopted within days of going to the shelter after their spay and neuter surgeries. It’s estimated that at least one of this litter will end up back at the shelter, in their lifetime though. It doesn’t matter how well the shelter screens applicants. No longer a tiny cute puppy. No longer with everyone clamoring to adopt him. People don’t realize how much work training a puppy can be. Or how much bigger they will get. Will I be fostering puppies again? Would you? I had actually forgotten how fun is can be to have a litter of foster puppies. It had been over a year. So I spent a lot of time just standing and watching them play. Fostering puppies by the litter is not my favorite. I actually prefer the older dogs, sometimes already house broken, sometimes not. I will absolutely foster puppies again. Only when I’m really needed to do it, though.